Microsoft has finally summated Skype group chats to Office Online in its latest update. Microsoft has announced this update back in November this year. Skype has rolled down this feature to office online and currently this feature is available for Microsoft Word documents and PowerPoint presentations. In future, it may be available for OneNote and Excel Online. With this latest update, if two or more users are working on the same PowerPoint or word document, they will be able to see a button for group chats which will allow them to begin a Skype chat while editing in Office Online by simply clicking on the chat button which appears in the upper right corner of the document. 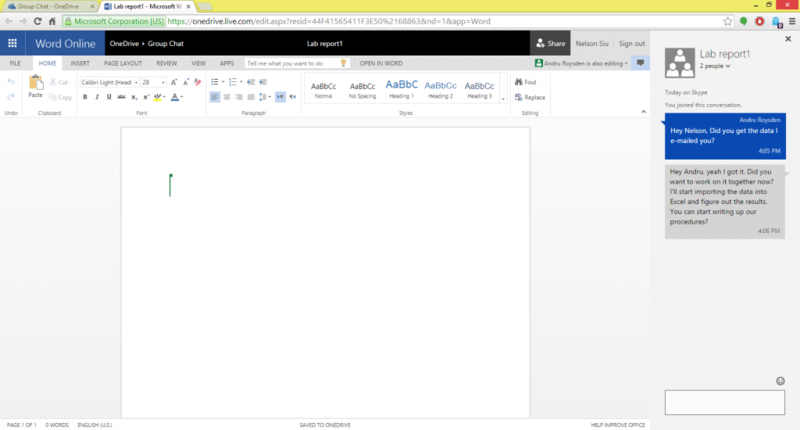 Microsoft wrote in its official blog, “Skype for Office Online makes collaborating a breeze. The chat experience is available right next to the document, enabling you to chat in and edit in real-time with other authors. Speed up and simplify document editing with quick Skype group chats instead of long e-mail threads. Keep track of which co-authors are online as well as messages you might have missed. Chatting function is available for desktop and mobile including the Windows Store application. To access the new chat functionality, you need to link your Skype account with the Microsoft.